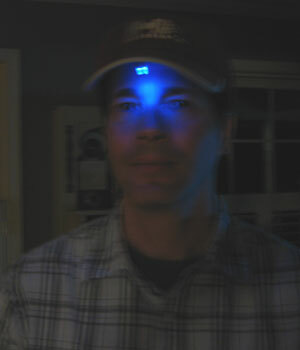 Recent studies show that blue-shifted light has a great effect on our brains, our sleep, and by extension, our bodies. Our brains use blue light to help set our circadian rhythm which regulates sleep timing. Our modern society with TV, fluorescent lighting, and computers is causing many people to have trouble falling asleep at night and staying awake during the day. We don't get daily cycle clues soley from the sun anymore like our ancestors did for thousands of years. Presented here is a simple project you can make which shines blue light into your eyes to adjust your sleep cycle. 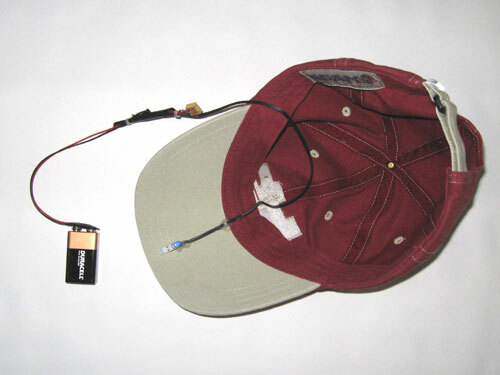 This example is mounted on a baseball cap, but you could also mount the circuit on glasses. Use the Blue LED Hat during the morning to set the start of your wake cycle, then avoid exposure to blue-shifted light in the evenings. You may also want to try using the hat while doing activities that normally put you to sleep. Of course, don't tempt the Sandman by experimenting with dangerous situations like driving. Monitor your wakefulness and see if you can quantify the effectiveness. 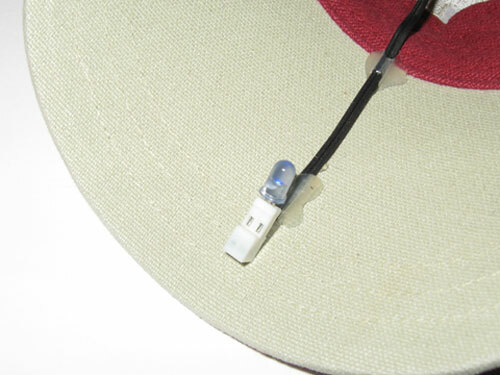 The connector is hot-glued to the hat, angled towards the face and slightly downward. The 2-pin female .1 MTA connector is available from Mouser (AMP #6404412). Crimp 24awg stranded wire using a small flat-head screwdriver. Any commonly available diffused blue LED will work. Just trim the leads and insert into the connector. LEDs are polarized, so if it doesn't shine, turn it around. The hat I used had a fold inside the rim where the battery and trimmer pot stored nicely. You might want to use velcro for a better mount. Standard 9V battery clips are available at Radio Shack. Solder or twist the wire joints, then cover with electrical tape or heat-shrink tubing. I've drawn 3 circuits here. The first one is very simple with just a current limiting resistor. If you connect an LED directly to the battery, it will burn out without the resistor. 1k ohm will limit the current to about 10ma. The second circuit provides intensity adjustment. The third circuit uses a 555 chip to pulse the LED at 30hz.